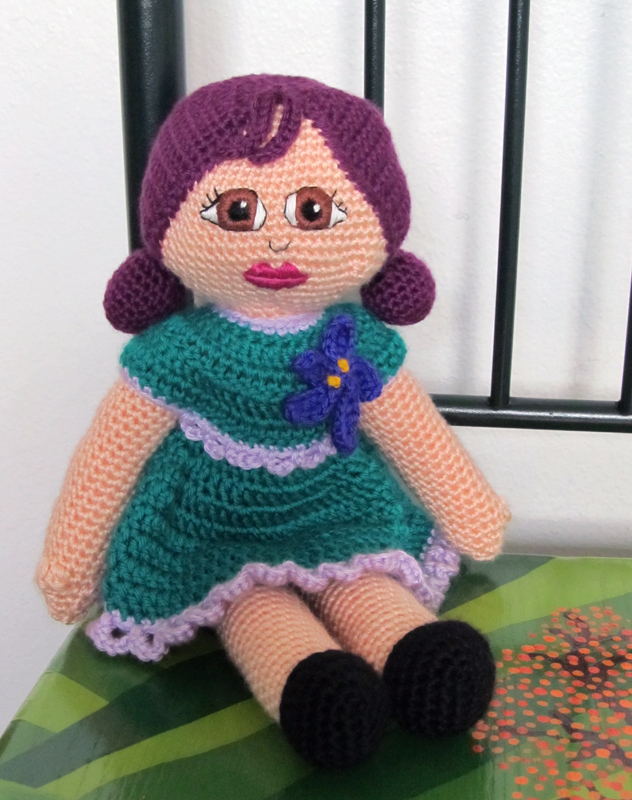 About a month ago, my friend Vanja published a crochet pattern for a very cute Mooshka Doll on her AmigurumiBB blog. To be honest, I had never seen a Mooshka Doll before. I thought surely this was a doll that Vanja had made up or one that came from Croatia where she lives. They are irresistibly adorable and undeniably huggable. I had to make one! For those of you who already know what a Mooshka is, I should explain: when I made my own, I got caught up in crocheting the doll and I forgot about some of the key “Mooshka” elements like the big, round eyes and colorful striped stockings. Now that I look at her, I think she really needs some colorful hosiery. It wasn’t until after I was finished that I decided to research the origins of the Mooshka. It was a little disappointing to find that the doll didn’t originate in Eastern European folklore, but instead with MGA Entertainment (the makers of Bratz), but she’s still really adorable and she has a good message. According to the website, their story goes like this: a group of paper dolls joined hands and, by the power of friendship, became real girls. They can be bought at Target in the US or made using AmigurumiBB’s fantastic and free pattern. I would, of course, recommend making one of your very own using Vanja’s pattern. My favorite part was making the hair! It’s crocheted in one separate piece, done in rows that part around the face. You add two little buns to the sides after you sew the hair on. It’s quite cute! The only trouble I had was with the placement of the arms, but in talking it over with Vanja, we were able to work it out. If after you are done with the head and ready to start the arms, you notice that you are at the front of the body (the head will be horizontal like a flat sewn doll), instead of continuing with the pattern, fasten off your yarn. Then flatten the chest so that you can find the side center stitch. Count 7 stitches back from this, and reattach your yarn there. Count 15 stitches forward (including the stitch where you attached your yarn), and single crochet those 2 stitches together. Continue with the pattern in rounds to create the arm. Repeat for the opposite arm. The pattern will completely impress you. The hands are elegantly simple. The body is beautifully shaped. And I’ve already mentioned how much I love the hair. You can embroider the facial features as I did or use Vanja’s pattern for those big, beautiful Mooshka eyes. I have a feeling every little girl is going to want one. Vanja, you really have your finger on the pulse of the American toy industry! Kudos for that and especially for providing this wonderful pattern. Have fun making your Mooshka dolls, everyone! Categories: Crochet It | Tags: amigurumi, crochet, diy, doll, huggable, Mooshka, oh-so lovable, softies, sweet | Permalink. They really are lovely as are all of Vanja’s dolls and things she creates. i love your rendition and would love to make one too. Vanja does the best hair EVER! Your Mooshka doll is lovely. What is her name? Aw, thank you. I have learned so much from you two fantastic crocheters. You are both so talented! I haven’t thought of a name yet. I’ve just been calling her Dolly, which, come to think of it, is exactly what I did with each of my dolls when I was a kid. How funny! Thank you for all the tips and help regarding my flaws in the pattern. And thank you once again for making Mooshka doll. Vanja! You are so welcome. It was my pleasure to make her. Your pattern is so fun and enjoyable, I just HAD to share it with all my friends at the picnic. It’s so cool that we have found this little crochet community to share with. I’ve benefited so much from your advice and guidance too. I’ve learned so much from you and I can’t wait to try another one of your patterns. So much fun!